How did this happen?! I added 12 1/2 yards of fabric to my stash this week! I'm starting a new round robin project with friends and bought a few half-yard cuts to throw in with my center (shown above), then a local store had a 35% off sale and I knew they had a red that I've been wanting for quite a while, then, then, then…. you know exactly how this goes! I think I'm going to impose a bit of a moratorium on fabric buying until I get to Houston for the quilt market and show. I've never been to the Houston Quilt Festival before, so I'm pretty excited! There has been a bit of sewing going on this week, mostly testing a block and binding three quilts. My husband is attending a wood carving camp next month and I'm going along with my sewing machine. I've got a great project all ready to go and it will use up over 20 yards for the front and back. Getting that complete will really help my numbers. My goal this year was to sew 200 yards and have a net number of at least 100 yards. I'd better get a wiggle on it! Today I'm linking up with Judy over at www.patchworktimes.com. Check out her blog to see how everyone else did this week. P.S. 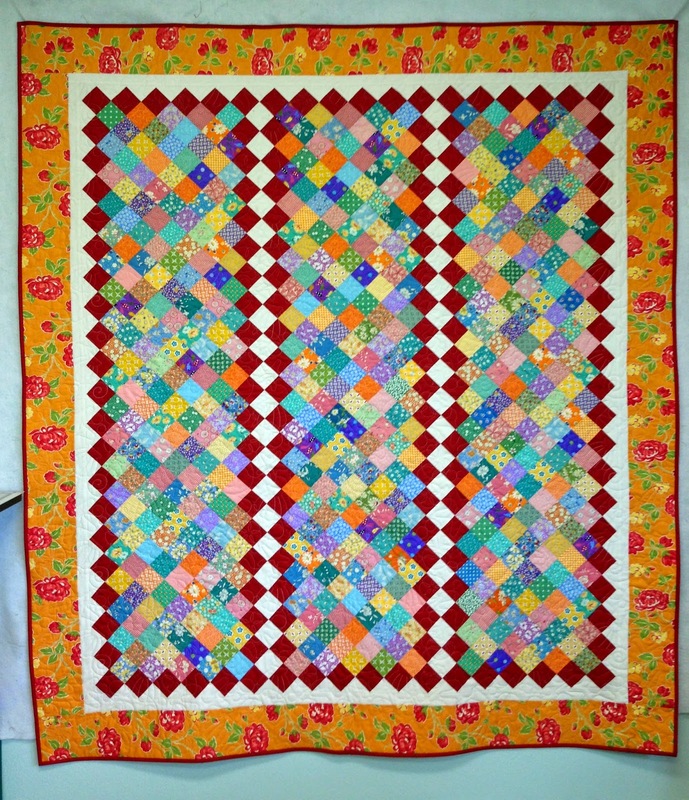 : My block is based on a Bonnie Sullivan block in her book Happy Trails (2005). 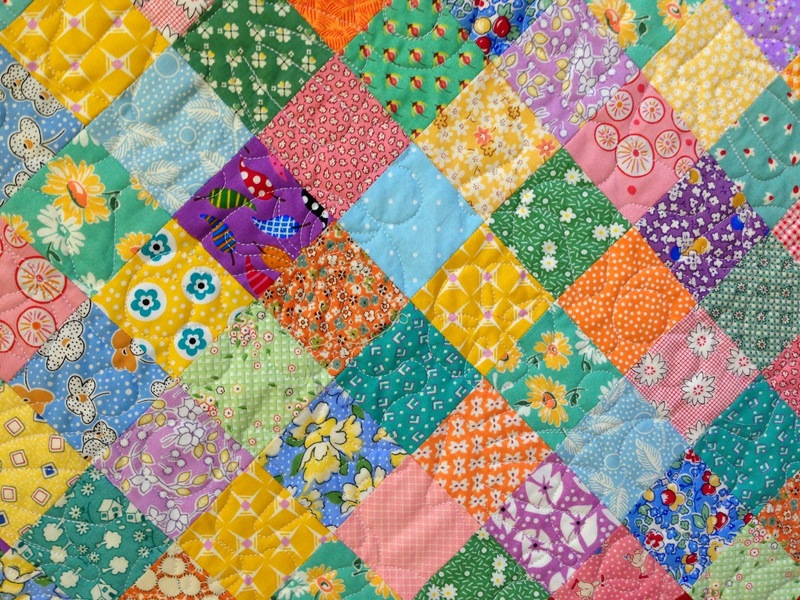 For today, I'm linking up with Crazy Mom Quilts and Confessions of a Fabric Addict. I know Father's Day is coming up, but I'd like to celebrate my mom today! 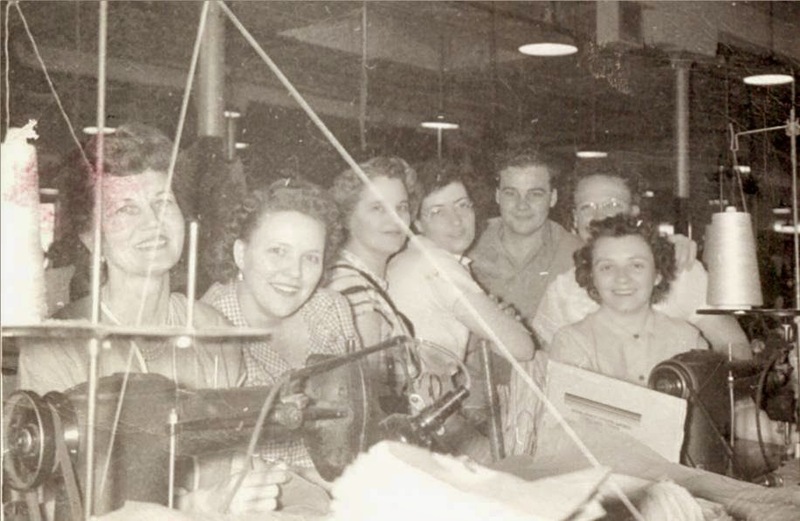 Here's a picture of her when she sewed shirts at the Miller Mfg. Co. in Joplin, Missouri. Mom's the one at the far right, looking directly into the camera. Here's to you, Momma! No fabric in or out this week, but a little sewing got done. Darling little half-square triangles! I'll show the project as soon as I'm finished. 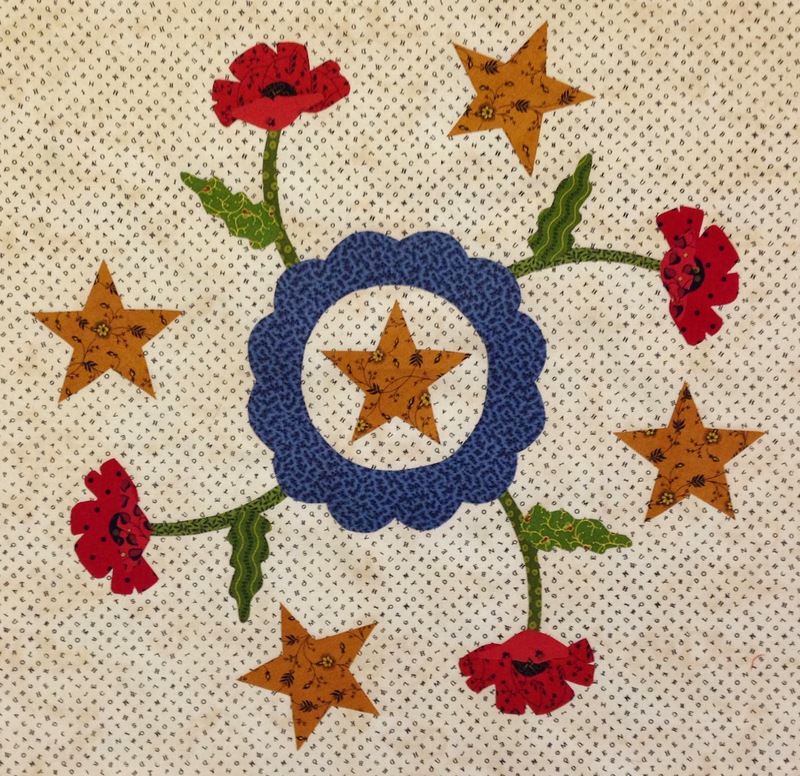 I'm teaching this class at Ocean Waves Quilt Camp at the glorious Oregon coast in October! My sewing room is also clean – it's been a disaster since last December. You should see the boxes stacked outside the sewing room, though! Some are going to my local guild, Westside Quilters Guild, some to Salvation Army, some to recycling, and several boxes to be shipped to quilters. Not sewing was worth it to have the room this clean. Never thought I'd say those words together in a sentence! Today I'm linking up with Judy over at www.patchworktimes.com. Check out her blog to see how everyone else did this week. I got my Celtic Solstice mystery quilt (quiltville.blogspot.com) back from the longarmer and I just love it! 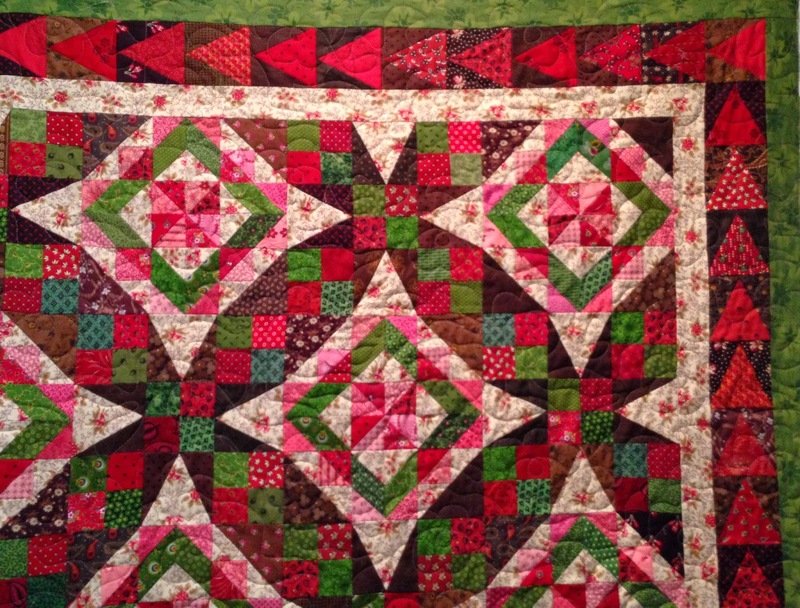 I've wanted to use brown, red, green, and pink together in a quilt for years now. I felt so guilty about my recent fabric purchases, though, that I spent a couple of days making quilt backs for five finished tops. One more back to make and then I'm off to a new quilt! I've got several designs in the works and will share just as soon as I can. First, I need to spend some quality time cleaning my sewing room. 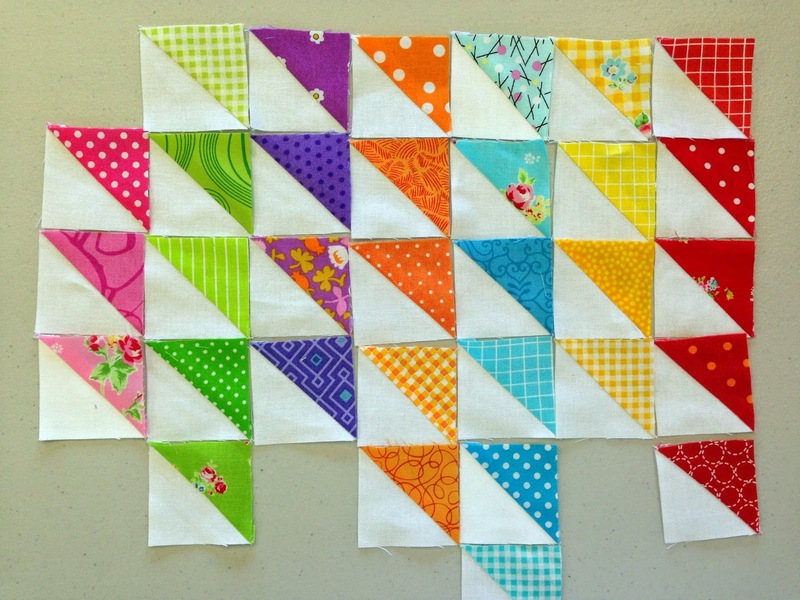 My goal is that next week I can report binding yardage for at least two quilts. Wish me luck! Today I'm linking up with Judy over at www.patchworktimes.com. Check out her blog to see how everyone else did this week.